No street in Paris is more well known than the Champs Elysees avenue. This is may be the best luxury shopping avenue in the world. The tree lined avenue is 1.2 miles long and runs from the Arch of Triumph to the Egyptian obelisk at the place de la Concorde. 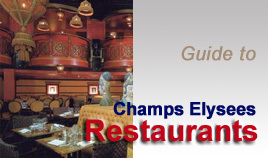 We have listed the best tables of the area... Trendy places to eat like La Maison Blanche, Le Man Ray or Pershing Hall - Gourmet restaurants - Plaza Athenee, Lasserre, Ledoyen, Spoon, Taillevent - Brasseries & bistros ... A large choice of places to eat for a romantic dinner or a lunch before a visit to one of Paris attractions. The avenue runs for 2 kilometers (1.3 miles) through the 8th district in the northwestern part of Paris, from the Place de la Concorde in the east, with its obelisk, to the Arch of Triumph. The lower part of the Champs-Elysees is bordered by greenery and by buildings such as the Theatre Marigny and the Grand Palais - recently reopened to Public. The Elysee Palace - French President's place - is located nearby, not on the avenue itself. Further to the west, the avenue is lined by cinemas, theaters, cafes and of course restaurants and luxury specialty shops. The Montaigne avenue is the beginning one of the most famous luxury shopping area : The Golden Triangle.